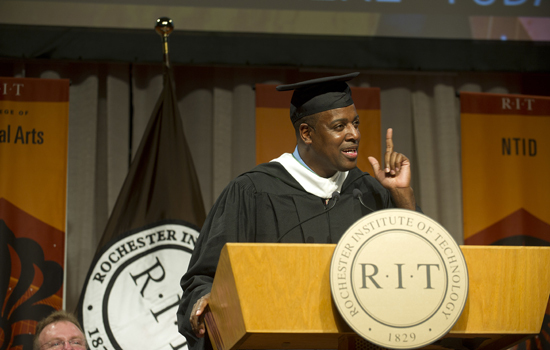 Joe Williams, a criminal justice lecturer in RIT’s College of Liberal Arts who won the Outstanding Teaching Award for Non-Tenure Track Faculty this year, was the keynote speaker at this year's convocation ceremony. So I got to thinking and figured it out: this is Provost Haefner’s doing and here’s why. He stopped by my office one day to again congratulate me on winning the Outstanding Teaching Award. He says: “Hey Joe. What are you working on?” I said: “My Corrections class.” He didn’t know that I like to talk – a lot. I’m looking at this new chair of the Committee on Corrections and he’s pushing some tough and radical legislation. Second, I’m looking at the billions of taxpayer dollars that New York state spends on prisons and it’s an awful lot. I only have two words for you Mr. Provost: “IT WORKED: Because I’m scared as heck of here.” I told my friends Dawn Murray and Stephanie Rankin that I wouldn’t be nervous – but I am. I’m kidding: Jeremy’s a very nice man and so I want to thank him and Sue or anyone who might have played a role in allowing me to speak to you today. Perhaps this speech will be too might be forgettable – but I hope not. Since I am an alumni, I have some simple but important words of wisdom – and I hope you don’t forget. FIRST, be happy and excited to be here. RIT and NTID is the brass ring: and you should want to work hard for this goal. Let the anticipation motivate you. Remember that you must: Prioritize your schedule – time management is critical; classes first, studying second, other things third – students do this the other way around; Make sacrifices – less socializing; Get help when you need it: “I don’t need help Professor.” Studied the night before and got an A – can’t do that here. Second, eliminate doubts and fears. Let me say that if you doubt that you belong here: STOP!!! You’re here because you deserve to be here. I know Dan Shelley (Associate Vice President and Director of Undergraduate Admissions) and Sally Douglas (Senior Director of Admissions): and they’re two of the sharpest people I know at RIT. So I know the team that they have in the Admissions Office is just as sharp: and so I know you wouldn’t be here unless you belonged. It doesn’t matter if you’ve come in under some summer program or early start program: you belong here. So eliminate doubt – and have a strong sense of belonging. Third, pick excellent mentors and role models (maybe a Professor). Pick and choose someone who is uplifting and inspiring. Even our own Dr. Sandra Johnson, SR. Vice President of Student Affairs, in a recent article talked about the importance of getting good mentors. I have several: Dr. Howard Ward, Dr. Kevin McDonald, Dr. John Klofas and Dr. Judy Porter to name a few. There are so many others that I can’t mention. Fourth, guard your mind and be very careful what you believe in. When I was 18, the WORST MISTAKE I ever made in my life was listening to people who doubted me and didn’t have my best interest in mind. I overvalued their opinions – all of which were negative. That plagued me for quite a bit in my adulthood. Always believe in yourself and find others that do as well. So, plant success in your minds and nourish it daily. In the end, it will pay off. Finally, to the Parents: I want to applaud you: you’ve done well. We trust that you’ve instilled your student with the proper value system they will need. You can give your student space now to grow: you don’t need to hang over them. I can hear the students saying: “take it easy Professor: someone’s got to pay the tuition bill.” Please give your students a little room. They know where home is if they need you. So remember students, although this speech will certainly be forgotten, please don’t forget what I’ve shared with you – I’m an alumni and we are family now. I thank you for coming; Families drive carefully, God bless everyone and have a great evening.